JR West covers the whole of Honshu west from Joetsumyoko on the Hokuriku shinkansen and west from Maibara on the Tokaido shinkansen. On ordinary lines it includes travel on the Oito line from Itoigawa down to Nakatsuchi; on the Takayama line from Toyama down to Inotani; on the whole Johana line, on the Etsumi Hoko (Kuzuruyu) line east from Fukui, and west from Shingu on the Kisei Line. Prices are fixed in yen, but the charge is payable in local currency. The prices in brackets are for rough guidance only and are for the exchange rates in Japan by Rail (4th edition published in July 2016); see Updates and news for conversion equivalents in April 2017. However, the exact cost you pay depends on the exchange rate used (by the pass provider you go to) at the time of purchase. It’s worth shopping around as travel agencies apply different exchange rates. Children aged 5 and under travel free providing they do not occupy a seat; those aged 6-11 pay half the adult rate. For full details of all JR West’s passes (it also offers some in conjunction with JR Central/Tokai) as well as a full route map see JR West‘s website. Evangelion shinkansen, which operates as a Kodama service (stopping at every station) between Shin-Osaka and Hakata. This is valid for 7 days and costs ¥19,000 (£119/$167), ¥20,000 if bought in Japan. The pass is valid for travel on the shinkansen between Shin-Osaka and Hakata (with reserved seats) as well as on limited express services in the designated area, which is most of Western Honshu and some of Kansai. For a 14-day holiday in Japan this pass combined with the Hokuriku Arch Pass (see p33 in Japan by Rail) would cost about ¥3000 less than a 14-day Japan Rail Pass. However, the downside would be that you can’t see Kyushu beyond Hakata, nor can you spontaneously head off to Shikoku, both of which you could with a Japan Rail Pass. For itinerary suggestions see pp45-6 in Japan by Rail. This is valid for 7 days and costs ¥15,000 (£94/$132), ¥16,000 if bought in Japan. The pass is valid on Sanyo shinkansen services from Shin-Osaka to Okayama, services to Shingu (inc Kansai Airport) from Osaka, Kyoto or Nara as well as services on the Thunderbird LEX up to Kanazawa and from there on the Hokuriku shinkansen (excluding Kagayaki services) east to Joetsu-Myoko. It is also valid on some non JR lines as long as the pass-holder only stops at the stations that link with the JR lines. 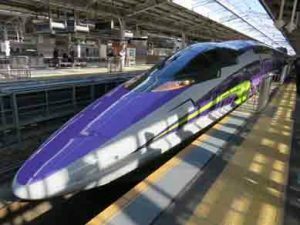 It is important to note that services to Takayama are not included; nor is the reserved seat fee for any shinkansen service; nor is the pass valid for the Tokaido shinkansen between Kyoto/Maibara and Shin-Osaka. For itinerary suggestions see p46 in Japan by Rail. The Hikari Rail Star is operated by JR West between Shin-Osaka and Hakata. These trains do not have Green Car seats but the seating in all carriages is 2 ≠ 2. Most Rail Star trains operate as a Kodama service (stopping at every station). The Kansai Wide Area Pass is valid for 5 consecutive days and costs ¥8500 (£53/$75); ¥9000 if bought in Japan. It is valid for unreserved seats on the Sanyo shinkansen (Shin-Osaka to Okayama) and several limited express trains in the Kansai region. The Kansai-Hiroshima Area Pass is valid for 5 consecutive days and costs ¥13,000 (£81/$114); ¥14,000 if bought in Japan. This pass has the same validity as the Kansai Wide Area Pass, but includes travel west to Hiroshima on the shinkansen and to Iwakuni on ordinary services. It also includes the ferry to Miyajima. 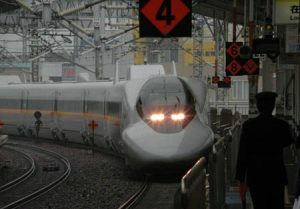 The Hiroshima-Yamaguchi Area Pass is valid for 5 consecutive days and costs ¥11,000 (£69/$97); ¥12,000 if bought in Japan. The pass includes travel in unreserved seats from Mihara shinkansen station to Hakata and mainline services from Onomichi station but also up to Masuda and Tsuwano. It also includes the ferry to Miyajima. This pass is valid for 4 days and costs ¥5000 (£31/$44); ¥5500 if bought in Japan. It is valid on Hokuriku shinkansen between Kurobe-Unazukionsen and Kanazawa, in non-reserved seats; also on conventional JR lines down to Johana, up to Himi/Wakura-onsen and west to Tsuruga. This pass is valid for 4 days and costs ¥4500 (£28/$40); ¥5000 if bought in Japan. It is valid only for stops on conventional JR lines between Okayama/Kurashiki and on the Sanin coast between Tottori and Masuda. One advantage is that this pass includes travel on the private Chizu Express Line which means it is possible to go from Okayama to Tottori without paying an additional fare. This is useful if you’re spending only a few days in and around Kyoto or Osaka and plan to make a couple of short excursions. It covers travel on local trains only between Kyoto, Osaka, Kobe, Nara, Himeji and Kansai Airport. It is also valid for non-reserved seats on the Haruka LEX to Kansai Airport. However, the Kansai Thru Pass (see box p34 in Japan by Rail), which is valid for travel on private lines in the Kansai area is fractionally cheaper and can also be used by Japanese resident abroad. Note: All the above cost an additional ¥100-200 if bought in Japan.